Freedom Plaza, originally known as Western Plaza, was renamed to honor Martin Luther King, Jr. In the photograph above the United States Capitol is visible at the far end of Pennsylvania Avenue. Also to the right of the Capitol and a good bit closer is the Old Post Office Pavilion with a tower that provides an excellent view of Freedom Plaza and most of Washington DC’s well known sites. 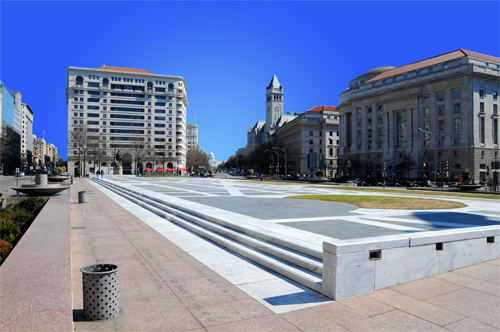 Western Plaza consists of a large raised terrace in which part of L’Enfant’s original 1791 plan for Washington, D.C. is rendered in black and white stone. At one end of the raised terrace is a pool. At the other is a shaded sitting area around a statute of General Pulaski. Inscribed on the upper terrace are historic quotations about Washington. Low walls separate the plaza from the surrounding traffic. Eleven large urns rest on top of these walls and contain seasonal planting. The upper map terrace has a grass lawn where the mall occurs and inlaid bronze plans of the White House and the Capitol located at either end of Pennsylvania Avenue. The inlays illustrate L’Enfant’s intention to have these two buildings balance each other and symbolize two main branches of government. The siting of the Treasury in the 19th Century blocked the view of the White House and obscured this relationship. L’Enfant’s plan of Washington combines two orders of scale. The giant order is the diagonal avenues that sometimes terminate in a building or a monument. This order characterizes the federal scale of the city. The minor order is the rectangular grid pattern of the local structure of the city. Western Plaza acknowledges both orders since it is shaped by the rectangular grid of the local scale and is an element within the giant order of Pennsylvania Avenue. Freedom Plaza is located between 13th and 14th Streets NW where Pennsylvania Avenue intersects those two streets. In fact Freedom Plaza is right where Pennsylvania Avenue would be if it were not been slightly rerouted in order to make room for the Plaza. Click Here for Google Map showing the location of Freedom Plaza. Closest Metro Station: The Federal Triangle Metro Station on the Blue and Orange Lines is the nearest Metro Station to Freedom Plaza, although in The Lost Symbol by Dan Brown, he does make something of the fact that the Metro Center Metro Station on the Blue, Orange and Red Lines is also nearby. Lost Symbol by Dan Brown: Freedom Plaza is mentioned in chapters 75, 76, 78 and 79. The 555 foot tall Washington Monument is located at the west end of the National Mall and in a straight line with the Lincoln Memorial, the Reflecting Pool, the World War II Memorial and the United States Capitol. The monument was designed by Robert Mills and was constructed between 1848 and 1884 with a significant delay in construction in the middle of that period caused in large part by the American Civil War. The Washington Monument is constructed primarily of white marble from Maryland with some from Massachusetts. The foundation is blue gneiss from Maryland and granite from Maine. It is the tallest stone structure in the world. Click Washington Monument to visit the Washington Monument website. The Washington Monument has no street address. It is located between 15th and 17th Streets NW, and between Constitution Avenue NW and Independence Avenue SW in Washington DC. Click Here for Google Map showing the location of the Washington Monument. Closest Metro Station: The Smithsonian Metro Station on the Blue and Orange Lines is the nearest Metro Station to the Washington Monument. Lost Symbol by Dan Brown: The Washington Monument is mentioned in chapters 1, 3, 6, 128, 129, 131, 132 and the Epilogue. The United States Capitol is located in what used to be the center of Washington DC (before a portion of the city’s land was returned to Virginia). 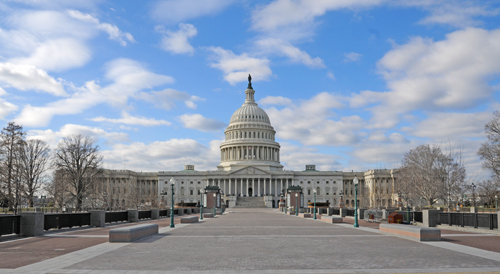 The Capitol provides meeting chambers for the two legislative bodies of the United States Government, the United States Senate and the House of Representatives. Historically the building provided space for other functions including chambers for the Supreme Court and room for the Library of Congress. Both of these functions have now been moved to their own buildings. Click Supreme Court to see the StationStart.com entry about the United States Supreme Court. Click Library of Congress to see the StationStart.com entry about the Thomas Jefferson Building of the Library of Congress. There are many things to see and experience at the Capitol that will be covered in additional entries at StationStart.com. 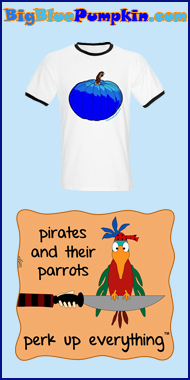 When those entries are added, links to them will be added to the bottom of this entry. Click United States Capitol to visit the United States Capitol (The Architect of the Capitol) website. The United States Capitol is located at 100 Constitution Avenue NE, Washington, DC 20002. Click Here for Google Map showing the location of the United States Capitol Visitor Center. Closest Metro Station: Capitol South on the Blue and Orange Lines is the nearest Metro Station to the United States Capitol. Lost Symbol by Dan Brown: The United States Capitol and the associated Visitor Center are mentioned many, many times, in chapters 1, 2, 3, 4, 5, 6, 10, 12, 13, 14, 16, 17, 19, 20, 21, 24, 26, 28, 30, 32, 33, 35, 36, 38, 39, 41, 42, 43, 44, 46, 48, 49, 50, 61, 62, 64, 69, 73, 74, 78, 80, 83, 91, 111, 117, 128, 129, 131, 132, 133 and the Epilogue. 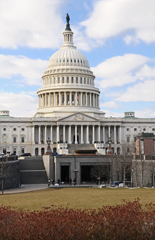 Facts from the book: Pierre L’Enfant, the designer of Washington, placed the Capitol on a raised area in Washington the he described as, “a pedestal waiting for a monument.” The building is 750 feet wide and 350 feet deep. It contains more than 16 acres of floor space divided among 541 rooms. George Washington laid the Capitol’s cornerstone on September 18, 1793. The Statue of Liberty could stand within the space provided by the Capitol Rotunda. Other StationStart.com entries that provide additional information about the United States Capitol. Click Apotheosis of Washington to see the StationStart.com entry about the Apotheosis of Washington, the massive painting on the ceiling of the Rotunda. Click National Statuary Hall to see the StationStart.com entry about the National Statuary Hall located in the Capitol and near the Rotunda. Click Statute of Freedom to see the StationStart.com entry about the female figure located atop the United States Capitol. The Library of Congress consists of three buildings, but the first of those buildings, the Thomas Jefferson Building, is often referred to as the Library of Congress. The other buildings are the Adams Building and the Madison Building. Click Adams Building to see the StationStart.com entry about that building. The Jefferson Building was constructed during the years 1988 through 1894. 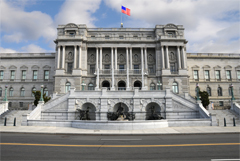 1.7 million people visit the Library of Congress each year. The Library of Congress Experience provides visitors with an interactive experience including the opportunity to turn pages of books from Thomas Jefferson’s library, inspect pages from the Gutenberg Bible, and view edits made in the rough draft of the Declaration of Independence. Visitors may also visit the Great Hall, the Main Reading Room and other areas. Click Library of Congress to visit the library’s website. The Thomas Jefferson Building of the Library of Congress is located on 1st Street SE between Independence Avenue and East Capitol Street. Click Here for Google Map showing the location of the Library of Congress Thomas Jefferson Building. Closest Metro Station: The Capitol South Metro Station on the Blue and Orange Lines is the nearest to the Jefferson Building of the Library of Congress. Lost Symbol by Dan Brown: The Library of Congress, occasionally referred to as the Jefferson Building, is mentioned in Chapters 46, 54, 55, 58, 59, 61, 69, 73, 80. Facts from The Lost Symbol: The Library of Congress houses what some have called the most beautiful room in the world. The library contains 500 miles of shelves. It expands at the rate of 10,000 items per day. It contains Thomas Jefferson’s personal collection of books. 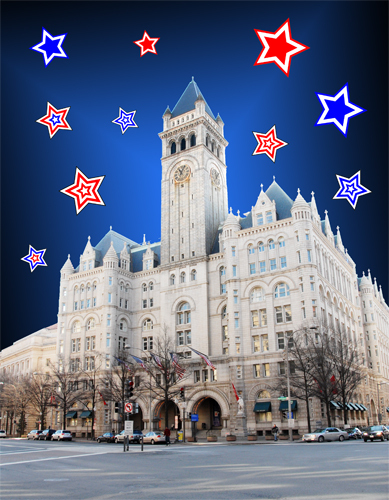 It was one of the first buildings in Washington with electric lights. 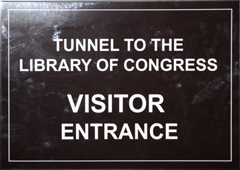 An underground tunnel links the Jefferson Building and the United States Capitol. The Washington National Cathedral is one of the most beautiful buildings in Washington with what seems like a never ending cascade of things to see and experience. Click Washington National Cathedral to visit the Washington National Cathedral website. 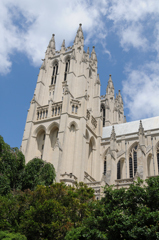 The Washington National Cathedral is located at 3101 Wisconsin Avenue NW, Washington, DC 20016. Click Here for Google Map showing the location of the Washington National Cathedral. Closest Metro Station: Cleveland Park on the Red Line is the nearest Metro Station to the Washington National Cathedral, but it is about eight-tenths of a mile away. That’s the approximate straight line distance rather than the actual walking or driving distance. 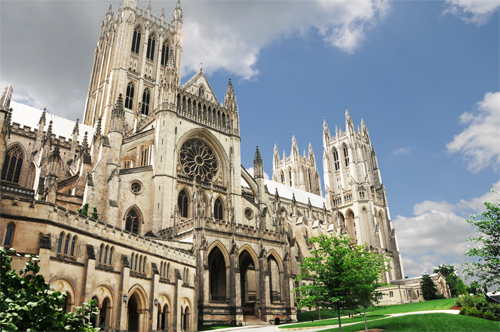 Lost Symbol by Dan Brown: The Washington National Cathedral is mentioned in Chapters 79, 82, 84, 87, 89, 91, 93, 123 and 130. Facts from The Lost Symbol: The cathedral has ten stones from Mount Sinai near the main alter. One of the stained glass windows has a piece of rock from the moon. Luke Skywalker’s father Darth Vader is a grotesque on the outside of the cathedral. It is the sixth largest cathedral in the world. It is taller than a thirty story building. There are over 200 stained glass windows. The carillon has 53 bells. The pipe organ has 10,647 pipes. Folger Shakespeare Library and Elizabethan Theatre, 201 East Capitol Street SE, Washington, DC. Notice the United States Capitol in the Background. 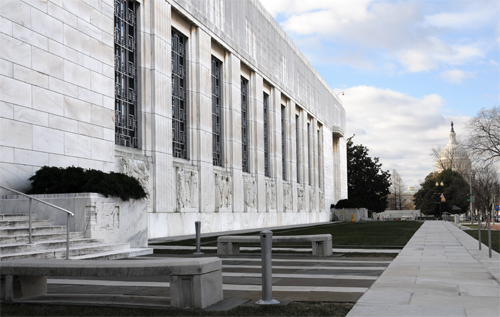 The Folger Shakespeare Library has the largest collection of Shakespeare materials in the world. In addition the building houses the Elizabethan Theatre with regularly scheduled performances of Shakespeare’s plays and other works. 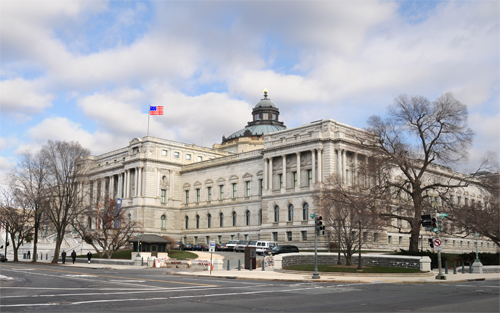 The Folger is near the United States Capitol, the Supreme Court and the Library of Congress. The Capitol is visible on the right in the photograph above. Click Bas Relief Marble Sculptures to see the StationStart.com entry about the sculpted scenes from nine of William Shakespeare’s plays that line the front of the Folger Shakespeare Library. Click Puck Sculpture to see the StationStart.com entry about the sculpture on the west lawn of the Folger Shakespeare Library of the character from William Shakespeare’s play A Midsummer Night’s Dream. The Folger Shakespeare Library is located at 201 East Capitol Street SE, Washington, DC. Click Here for Google Map showing the location of the Folger Shakespeare Library and the Elizabethan Theatre. Closest Metro Station: The Capital South Metro Station on the Blue and Orange Lines is nearest to the Folger Shakespeare Library. Lost Symbol by Dan Brown: The Folger Shakespeare Library is mentioned in chapter 73. 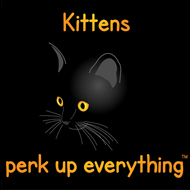 - Convenient location near the Federal Triangle Metro Station. 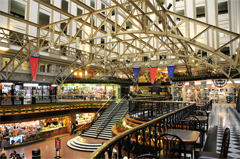 The Old Post Office Pavilion is one of Washington DC’s hidden and often overlooked gems. It was built in the 1890′s, and at 315 feet, it was Washington’s tallest building. Today there are only two buildings in Washington that are taller, the Washington Monument at 555 feet and the Basilica of the National Shrine of the Immaculate Conception at 329 feet. The core of the building is a huge, many stories tall enclosed space with a glass ceiling/roof. Originally the building housed the city post office, and it was also used as the offices of the Postmaster General and the US Post Office. The building still contains offices, but it has several things that are of interest to those who want to enjoy Washington DC. First the tower provides an unobstructed view in every direction. Most of Washington’s most popular sites are visible from the tower. I know these images are too small to see any detail in most of buildings, but still this does give an idea of the view looking west from the Old Post Office Tower. I have identified some of the features below. 1. Smithsonian Institution National Museum of American History. 3. National World War II Memorial. 4. Custis-Lee Mansion in Arlington Cemetery. 5. Gravesite of John Fitzgerald Kennedy. 6. Arlington Memorial Bridge with the Lincoln Memorial on the Washington DC side of the Potomac and Arlington Cemetery on the Virginia side. 8. John F. Kennedy Center for the Performing Arts. 9. White House obscured to some extent because the Treasury Building blocks a part of the view. 11. Washington National Cathedral With Grotesque of Darth Vader. The lower two floor contain a food court as well as a good number of stores. Many of the stores have a focus on souvenirs, but as it turns out souvenirs are not all that difficult to find in Washington. Closest Metro Station: The Federal Triangle Metro Station on the Blue and Orange Lines is nearest to the Old Post Office. There is an has an exit just across 12th Street from the Old Post Office. Lost Symbol by Dan Brown: Several of the sites in the photo above are mentioned in this book. 2. 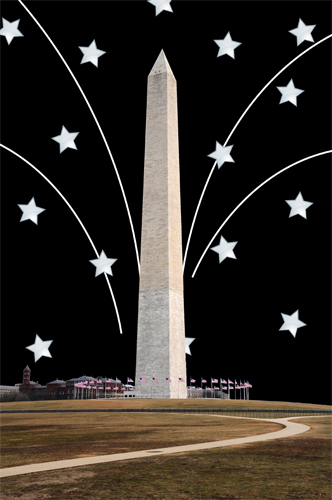 Washington Monument mentioned in chapters 3, 6, 128, 129, 131, 132 and the Epilogue. 10. Freedom Plaza mentioned in chapters 75, 76, 78 and 79. 11. Washington National Cathedral With Grotesque of Darth Vader mentioned in chapters 79, 82, 89, 91, 93, 123 and 130. This huge Masonic temple acts as headquarters for the Ancient and Accepted Scottish Rite of Freemasonry. It is also known as the Supreme Council, 33°, Southern Jurisdiction. This building, completed in 1915, was modeled after one of the Seven Wonders of the Ancient World, the Mausoleum at Halicarnassus. John Russell Pope was the architect for this building and for the Jefferson Memorial, the National Gallery of Art and the National Archives. 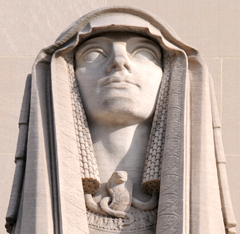 Two sphinxes guard the entrance to the building. The one on the left, carved from a single block of stone, represents power. Its eyes are open and there is a cobra around its neck. Guided tours are available for the House of the Temple every 15 minutes from 10:00 am until 4:00 pm Monday through Thursday. 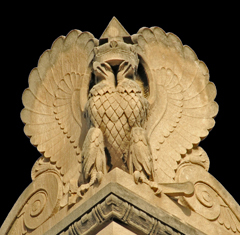 Each corner of the roof is guarded by a carved, two-headed eagle. The Supreme Council, Ancient and Accepted Scottish Rite, Southern Jurisdiction is located at 1733 Sixteenth Street, NW, Washington, DC. Click Here for Google Map showing the location of the Masonic Temple. 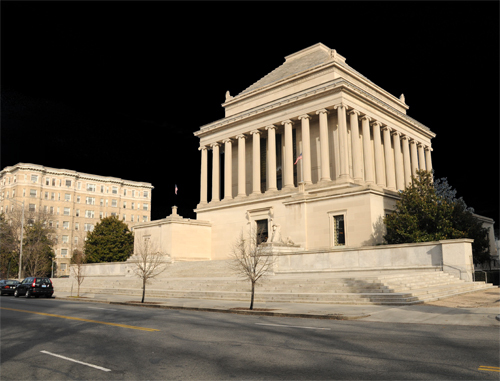 Closest Metro Station: The Supreme Council Temple is located about mid-way between the Dupont Circle Metro Station on the Red Line and the U Street/African-American Civil War Memorial/Cardozo Metro Station on the Green and Yellow Lines. Lost Symbol by Dan Brown: This temple is mentioned in the Prologue and in Chapters 84, 115, 117, 119, 124, 128 and 131. The United States Botanic Garden is located on the southwest corner of the United States Capitol grounds. The garden is run by the Congress of the United States and provides a unexpected and fascinating museum filled with living plants right in the middle of Washington DC. Visitors pass into the Garden Court when they enter the building. Behind that is the jungle/rainforest area. Around there outside edge of the building are many separate rooms, each with a different habitat. There are areas for rare and endangered plants, desert plants and plants from Hawaii. The Botanic Garden plays an important role in The Lost Symbol by Dan Brown. Often from the end of November through early January the Botanic Garden has displayed replicas of many of Washington’s government buildings. These replicas are made exclusively from wood and other plant materials. 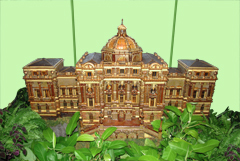 Shown here is a replica of the Library of Congress Thomas Jefferson Building. 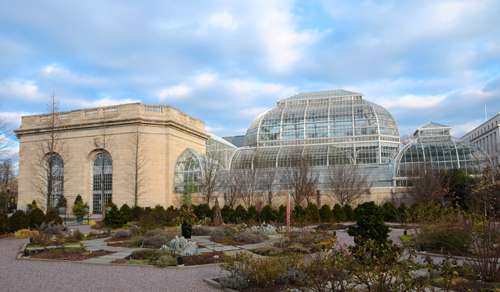 Like the US Botanic Garden, the Thomas Jefferson Building plays an important role in The Lost Symbol by Dan Brown. The United States Botanic Garden is located at 100 Maryland Avenue SW, Washington, DC 20001. Click Here for Google Map showing the location of the United States Botanic Garden. Closest Metro Station: The Capitol South Metro Station on the Blue and Orange Lines is nearest to the US Botanic Garden. 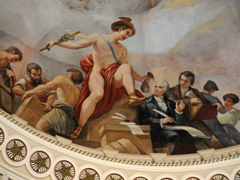 The Apotheosis of Washington is the massive fresco that forms the dome of the rotunda in the United States Capitol Building. It was painted by Constantino Brumidi in 1863, and the huge painting is 4,664 square feet. This painting depicts the elevation of George Washington to a position of preeminence and honor. This painting plays an important role in The Lost Symbol by Dan Brown. In the painting Washington is shown with a purple cloth or blanket on his lap. To his left is the goddess Victory wearing green and blowing a horn. To his right is the goddess Liberty dressed in blue and holding a ceremonial ax. In one scene of the painting Freedom is shown as a woman wearing a red cape, a golden helmet, silver armor. 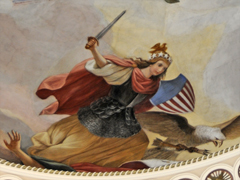 She is wielding a sword in her right hand and carrying a shield reminiscent of the flag of the United States. To her lower left is a bald eagle carrying arrows in its talons. 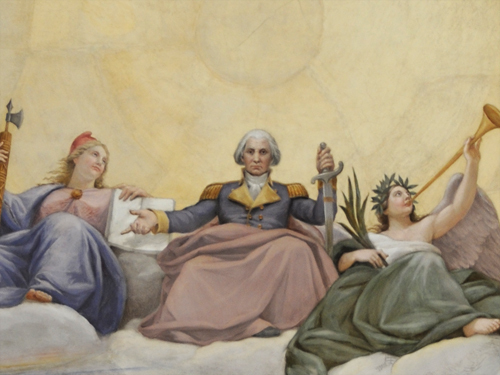 In the painting Freedom is located just below George Washington. Opposite Freedom is Commerce in the form of Mercury. Mercury, wearing a winged helmet and winged sandals, holds out a bag of gold for Robert Morris who signed the Declaration of Independence and the Constitution of the United States. Morris helped to finance the Revolutionary War. 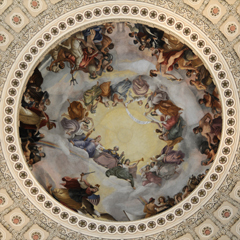 The Apotheosis of Washington is located in the rotunda of the United States Capitol Building and is accessible through the United States Capitol Visitor Center located at the intersection of E Capitol Street SE and East Capitol Circle. Click Here for Google Map showing the location of the Visitor Center Entrance to see the Apotheosis of Washington. Closest Metro Station: The Capitol South Metro Station on the Blue and Orange Lines is nearest to the entrance to the US Capitol Visitor Center, but the Union Station Metro Station on the Red Line is also close. If you’re already on the Red Line you may prefer to walk the extra distance from Union Station in order to avoid having to change to the Blue or Orange Lines in order to get to Capitol South.